Today marks the one year anniversary of my trip to teach at the distinguished Burdenko Institute of Neurological Surgery in Moscow, Russia. The trip provided an amazing opportunity for me to meet the brilliant and influential “Father of Russian Neurosurgery, ” Dr. Alexander Konovolov. The visit also afforded me the chance to reconnect with my dear friends and colleagues from St. Petersburg. I felt incredibly blessed. Not only did I meet Dr. Konovalov and tour the institute he created, I did so alongside my mentor, Dr. Peter Jannetta. The symposium felt like an induction ceremony for the international neurosurgical and orthopedic spine hall of fame. The list was impressive, topped with the names Jannetta, Samii, Vaccaro, and Konovalov. Imagine you grew up learning, loving, and following the game of baseball, and you were given the chance to play and coach at a hands-on clinic with the likes of Gehrig, Cobb, Mays, and Ruth. I was inspired and humbled. The event unfolded in a first class fashion, orchestrated with surgical precision by Dr. Konovalov’s right hand man, Professor Potapov. I always feel energized by scientific meetings, and this international affair felt like a double shot of espresso. Each presentation was designed to strengthen our medical body of knowledge and enhance our skills as surgeons so that we returned home better equipped to take care of our patients. The scientific sessions were followed by dinners at several of the five star restaurants in Moscow, and the food was spectacular. I can still feel the burn of vodka mixed with the taste of the crisp, pure flavors of sturgeon sprinkled with fresh dill. Although I always have been partial to the beautiful city of St. Petersburg, I was quite captivated by what Moscow had revealed to me. My trip to last year’s symposium was more than a decade in the making. It all started in 1997 during my first visit to Russia. 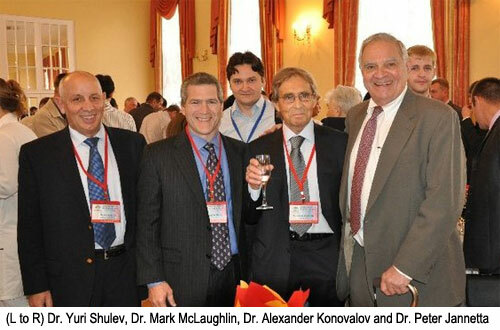 At that time I was a senior resident at the University of Pittsburgh and had the opportunity to spend a month in St. Petersburg collaborating with Russian neurosurgeons. I was struck on many levels my experiences with Drs. Yuri Shulev, Vadim Bikmullen, and Viktor Rudenko. As a physician, I was impressed with their medical ingenuity and resourcefulness. As people, and now my dear friends, I was deeply moved by their hospitality and authentic spirit. I was treated with such kindness on my first visit that I insisted on inviting my new Russian friends to the United States with the hope of reciprocating their generosity. I returned to Pittsburgh and scraped together a number of donations to fund their trip. My three new friends, Yuri, Vadim, and Victor touched down in Philadelphia in April of 1998 to attend our American Association of Neurological Surgeons national meeting. I was able to repay their graciousness by providing them registration to the event, complimentary hotel rooms, and a special trip for a stay at my parents’ house in Short Hills, NJ. My Russian friends found the beauty and charm of Short Hills fascinating. They were mesmerized by the size of the houses and the wealth that was implied. My attempts to explain that Short Hills is not representative of a typical American town fell on deaf ears, and they continue to associate the United States with that initial impression. Mary Jean, my mother, treated my friends like royalty and fed them like a classic Italian matriarch. We wrapped up their first visit to the USA with a trip to New York City armed, of course, with a bag of mom’s massive sandwiches. To this day they still remark about the weighty, overstuffed, salami and provolone sandwich known to them as a “Mary Jean”. In 2000, I returned to St. Petersburg with a team of American surgeons to teach a workshop in contemporary spinal surgery techniques. The trip was funded by the International Federation of Neurosurgical Societies and was the first of its kind to take place in Russia. 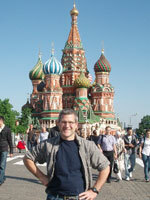 I returned again five years later when a larger international group was invited to St. Petersburg by Professor Shulev. The visit in 2005 was particularly meaningful for me and I shared my sentiments during the meeting’s keynote address. That brings us back to today, the one year anniversary of my trip to the Burdenko Institute. The last fourteen years I have been privileged to witness – and participate in – the evolution of Russian neuroscience. From trading surgical techniques to exchanging cultural lessons to sharing vodka, I forged a bond with Yuri, Vadim, and Victor that continues to shape my career and life. Winston Churchill once said, “you make a living from what you get but you make a life out of what you give.” I have been blessed to get, to give, and to grow with a few true friends in the process.